This little procedure just saved me over 20 gigs (yes, this is right, gigs!!) of space on my hard drive. It has to do with how Lightroom updates. Read on or watch the video. Here is something I was quite surprised to realize. With each catalog, you can set how long it would keep 1:1 previews. I usually set this for a month. Keeping 1:1 previews is quite useful as it really speeds up using the develop module. Sadly, 1:1 previews do take quite a bit of space. This is why Lightroom has a feature that allows you to automatically delete those previews after a while. For me this duration is set for one month. After one month Lightroom will automatically delete those previews. This is a great balance between usability and space. So each time that you run Lightroom, it looks at the catalog and checks if it needs to delete some old previews. But when you update a major Lightroom version, you are also updating the catalog (including its directory). So that old catalog will never run again, and Lightroom will never delete all those old previews. 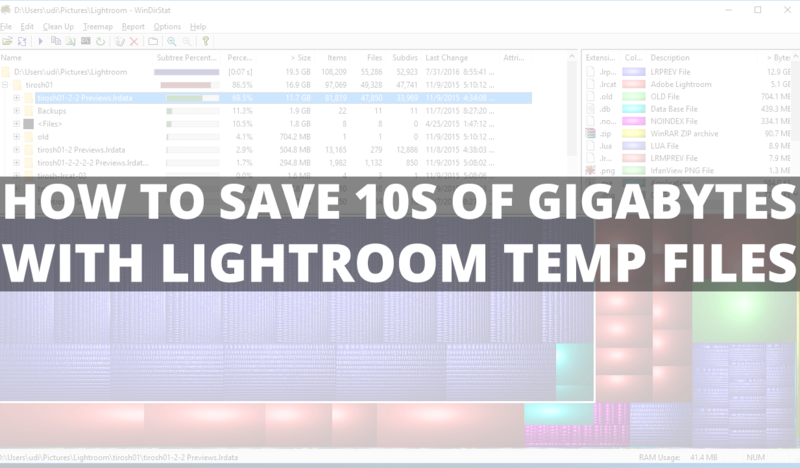 I was quite shocked to realize that my two-version-ago Lightroom installation had over 10 gigs of previews. Those were obviously deleted. There you go, I hope this saves you quite a bit of space as it did for me. Also after you upgrade you should uninstall the old version of LR unless you need it; and generally you can also delete the old catalogs if you also need it then store it on an external HDD or server. But I had no idea about the 1:1 previews; but the new LR CC offers smartpreviews and those do take up space but those are also significantly smaller and lower quality as those allow you to see the photos while your catalog is “offline”. Great tip, thanks, and great video. Very useful. Do you know if Lightroom cleans up the preview files even if you never open the related catalog again? For instance, if I have a separate catalog for each shoot, will opening a catalog I created today delete the previews from a shoot/catalog I did last month? So I’ve seen this article and one other like it both pointing to the same video, but he’s on Windows and I’m on a Mac, and despite taking a short while to look, I don’t know where this directory to delete would be stored in OS X. Does anyone know?